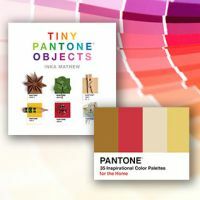 Pantone Journals are a range of Pantone inspired books and publications to connect children, adults and colour professional with the wonderful world of colour that surrounds our everyday lives. For more than fifty years Pantone has been inspiring design professionals with products, services, and technology for the exploration and expression of colour. In 1963 Pantone’s founder, Lawrence Herbert, created the Pantone Matching System, an innovative system for identifying, matching, and communicating colours to solve the problems associated with producing accurate colour matches in the graphic arts community. The original Pantone Book was a selection of standardised colour in fan format, very similar to today's Pantone Formula Guide. Today, the Pantone name is known worldwide as the standard language for accurate colour communication and the definitive international means for selecting, specifying, matching, and controlling colour.